I hope you are enjoying the summer. This e-newsletter features upcoming district events and other notes of interest. There remains a great deal of concern with Governor Wolf’s vetoes of first a balanced budget, and then of necessary cost-saving reforms for the state: a pension reform measure and a measure to divest the state stores. Rightly there needs to be public conversation about the governor’s proposed budget, and his arbitrary actions to veto each of the bills supporting the legislatively crafted budget for 2015-16. The legislative budget is balanced and has no new taxes. The governor’s proposed budget included $4.7 billion in new taxes on every Pennsylvanian resident and business. 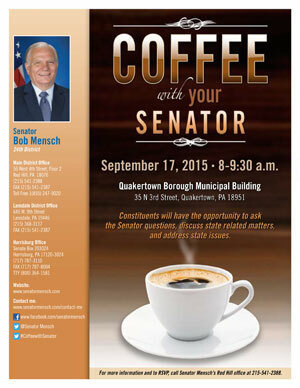 My next “Coffee with Your Senator” is fast-approaching! The next event will be held on September 17th at the Quakertown Municipal Building located at 35 North 3rd Street in Quakertown from 8 a.m. to 9:30 a.m . Constituents will have the opportunity to enjoy light refreshments with me as we discuss state-related matters and questions. Please RSVP by calling 215-541-2388 or by emailing srasmussen@pasen.gov. 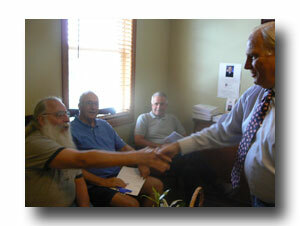 Constituents are encouraged to stop by as they are able. Attendance for the entirety of the event is not required. This edition of the Mensch Report features my tour at Speakeasy Coffee Company located at 875 Main Street in Pennsburg. This Montgomery County company is owned and operated by Nelson Floyd. Speakeasy’s coffees are hand-roasted in small batches. Small-batch roasting allows for nearly complete control over the roasting process and is ideal for providing the consumer with the freshest coffee possible. I encourage you to watch the Mensch Report which features a tour and interview with Nelson Floyd at this hidden coffee gem in Pennsburg. My first Veteran ID Outreach event with Representative Justin Simmons was incredibly successful. 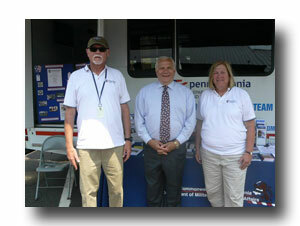 We had over 60 veterans attend the event to take advantage of the Montgomery County Recorder of Deeds’ Veteran ID Program and access the Pennsylvania Department of Military and Veterans Affairs mobile van for information on veteran benefits and programs. In addition, Montgomery County Veterans Affairs and a member from Senator Pat Toomey’s office were present to answer VA-related questions. The event was very successful and I hope to have a similar event in the near future. I am very grateful to all of the veterans for their service and I hope we were able to provide them with the help and assistance they needed. Imani Johnson from Senator Pat Toomey's took part in Senator Mensch’s Veteran ID/Outreach event. 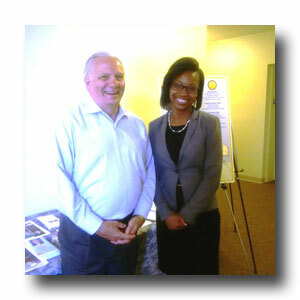 Imani helped several veterans with VA-related questions and concerns. Senator Mensch will be welcoming her and other staff members from Senator Toomey's office at future events to offer federal outreach. My internship program is designed to give college students an opportunity to intern in a legislative office and learn about how the state legislature operates. Students will discover and understand the function of various state agencies and develop a strong understanding of the legislative process. Participants in the internship program will become familiar with the duties and responsibilities of elected officials on a variety of levels. Interns will also have an opportunity to both visualize and apply the information and concepts taught in the classroom while providing the community with a public service. This program is an excellent opportunity for any aspiring academic or public servant. We encourage interested participants from all backgrounds and areas of study to apply. Interested students are encouraged to fill out an application to intern at our Red Hill office (Montgomery County). Please contact Sarah Rasmussen at srasmussen@pasen.gov, or at 215-541-2388 for more information. My office remains an official drop-off location for Cell Phones for Soldiers. Constituents are encouraged to drop off their newer or gently used mobile phones from all service providers at my Red Hill office (56 West Fourth Street, Floor 2, Red Hill, 18076). Since its inception in 2004, Cell Phones for Soldiers has worked to provide free communication services to active-duty military members and veterans. For a decade, the charity's longstanding calling card program, Minutes That Matter, has provided servicemen and women with an estimated three million prepaid calling cards, equating to more than 213 million minutes of FREE talk time. Cell Phones for Soldiers fuels its mission through generous monetary contributions and the recycling of donated mobile phones. On July 20, the Montgomery County Commissioners announced that wireless phone customers in Montgomery County had the ability to send short text messages to 9-1-1 in an emergency. At this time, Text-to-911 is only available to subscribers of AT&T, Sprint, Verizon Wireless and T-Mobile. Learn about how Text-to-911 works, as well as its limitations, here, and access frequently asked questions here. Create and capture new memories through the PA Fish and Boat Commission’s Family Fishing Programs. Visit the Commission’s Calendar of Events to select a convenient location for catching some family fishing fun. Select Fishing Programs from the “Categories” menu to locate opportunities during July and August. No equipment? No problem. Approximately 74 tackle loaner sites are located across the state where you can borrow rods, reels and a tackle box with ample supplies. Check out Basic Fishing Skills before heading out for a day on the water to enhance your experience. Avian competitions at state-approved agricultural fairs are suspended for the remainder of 2015 and at the 2016 PA Farm Show to stave off the accidental spread of Avian Flu, according to the Pennsylvania Department of Agriculture. Further, PA is implementing 72-hour interstate quarantines on domesticated poultry and eggs to head off an outbreak in PA.
Proactive steps focus on the prevention of a situation similar to the 1983 and 1984 loss of 17 million birds worth $65 million. Today, the spread of Avian Flu could have a significant impact on PA’s $13 billion poultry and egg industry. Efforts are underway to protect PA farms and domesticated fowl, including chickens, ducks, quail, pheasants, guinea fowl and turkeys, while 20 other states are grappling with the loss of nearly 50 million birds to Avian Flu. 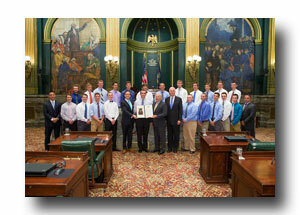 Senator Mensch introduced the North Penn Knights baseball team alongside Senator Stewart Greenleaf at the Capitol. The team, from North Penn High School in Lansdale Borough, Montgomery County, was crowned PIAA AAAA State Champions on June 12 after their 4-3 win over Wyoming Valley West. Listen to the Senate introduction here.